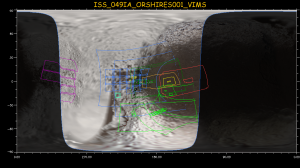 This page describes some aspects of the Cassini imaging observation planning. I was responsible for taking pictures of the satellites Dione, Rhea, Iapetus, and Phoebe, and for the complete observation campaign of the small outer or irregular moons. Until end-of-mission, I commanded ∼57,000 of the 443,186 images taken with the Cassini cameras and successfully transmitted to Earth. Diese Seite beschreibt auf englisch einige Aspekte der Beobachtungsplanung für die Cassini-Kamera. In meine Zuständigkeit fielen die Bildaufnahmen der Monde Dione, Rhea, Iapetus und Phoebe sowie das gesamte Beobachtungsprogramm für die äußeren oder irregulären Saturnmonde. Insgesamt kommandierte ich ≈57.000 der 443.186 Bilder, die mit den Cassini-Kameras aufgenommen und erfolgreich zur Erde übertragen wurden. Integration was the first of the two major planning steps in the Cassini observation planning procedure. Cassini’s trajectory was divided into multiple “segments”, each of them was assigned to one of the following six planning groups (disciplines): Saturn, rings, fields and particles (magnetosphere), Titan, icy moons, or cross discipline (XD). As a part of the icy-moons group (named SOST – Satellite Orbiter Science Team), I helped to compile the observation timelines for all icy-moon segments which included all close flybys at any Saturnian moon except Titan. Within segments of the other disciplines, I negotiated distant icy-moon observations and the observation plan of the irregular moons, especially for the Imaging observations. Implementation was the second planning step where the input from the individual disciplines was compiled and converted into flyable computer command files. The whole orbit tour at Saturn (from 15 May 2004 to 15 Sep 2017) was divided into 101 “sequences” which were between 5 and 10 weeks long. The compilation of these “background command files” was performed through several, strictly scheduled steps in order to gain error-free commands. A special effort, especially in the second half of the Cassini mission, was spent to keep the spin frequencies of the aging reaction-wheels within acceptable limits. Our task in Berlin was to provide the spacecraft attitude command files for the Imaging (“ISS”) prime observations of “our” moons, as well as the camera command files. Note that the camera was named “ISS” (Imaging Science Subsystem) in 1991, long long before the International Space Station was built and also named “ISS”. One of my highlights was the compilation of the plan for the sole close flyby of Iapetus on 10 Sep 2007. The flyby was dubbed “049IA” for the Cassini orbit (#49) and the observation target (Iapetus). A description of the flyby’s history and outcome, published in the Planetary Report in early 2008, can be found here. An article in German can be downloaded from here. 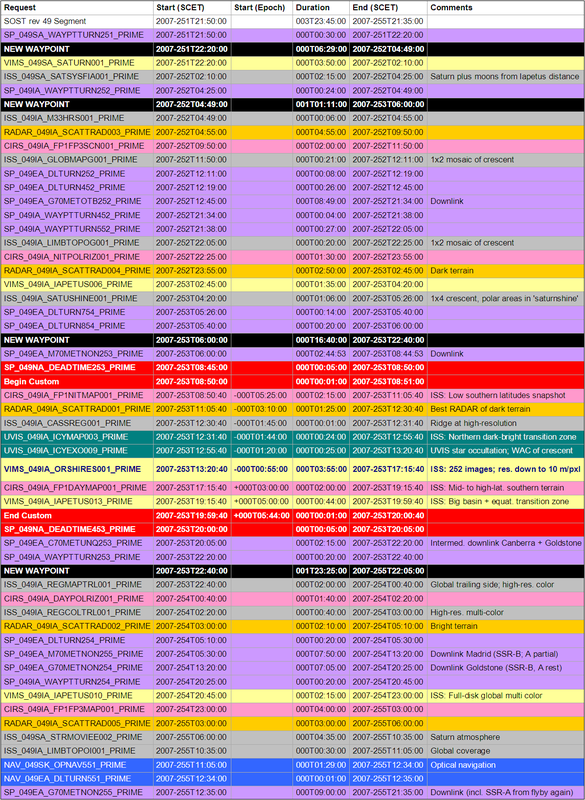 Table to the left: Timeline (excerpt from the “Spacecraft Attitude Spreadsheet” or “SPASS”) of the targeted Iapetus flyby, as planned in integration of the SOST segment in orbit 49. The activities (“requests”) are listed in the left column, followed by times. A start epoch was selected close to Iapetus when the observation activities were done relative to closest approach and not at an absolute time scale. 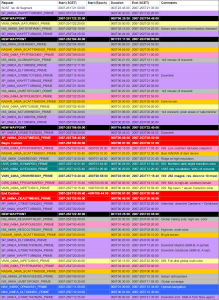 The colors of the lines indicate different science instruments or engineering groups which were “prime” (controlling the spacecraft attitude) during each request’s time frame. The most important activity was from ∼1 h before to ∼3 h after closest approach (prime request VIMS_049IA_ORSHIRES001_PRIME). Although imaging (“ISS”) was not prime here for some reason, my responsibility was to put these observations together for all instruments and make them “flybable”. 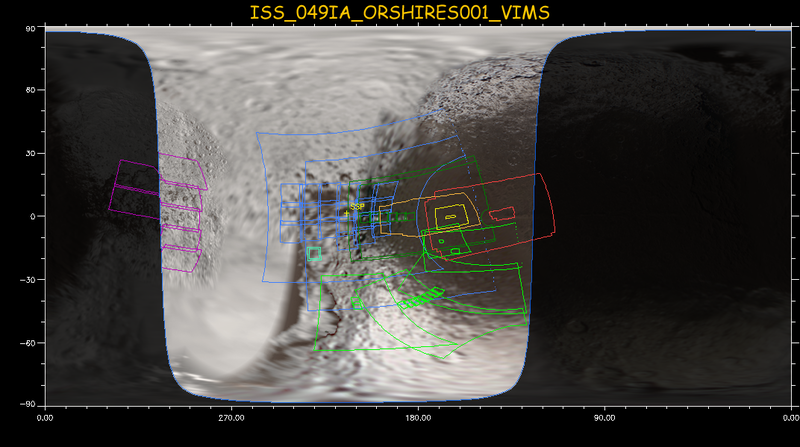 Figure at right: Imaging coverage during closest approach and departure over lit site (observation request named VIMS_049IA_ORSHIRES001_PRIME in the SPASS). The plot shows the camera pointing superimposed on a cylindrical map of Iapetus as it was available in early 2007. The Cassini spacecraft approached from the right (unlit side of Iapetus) and departed over the lit side (toward left) on an almost equatorial trajectory. The frames show the field-of-views of the Narrow-Angle camera (NAC; 21 arcminutes) and the Wide-Angle Camera (WAC; 3.5 degrees). The colors indicate the order of the observations (red was first, followed by orange, then yellow, etc.). For the first three observations, only the outline of the complete image mosaics is shown, not the individual panels. Closest approach to Iapetus occured at 14:15:49 UTC/SCET (Spacecraft Event Time) during the third observation (in yellow) at an altitude of 1622 kilometers above the surface (this is slightly more than one Iapetus diameter of ∼1500 km). During the fourth observation (in light-green), 23 to 39 minutes after closest approach, the spacecraft made an ∼90° roll around the optical axes of the cameras to put the field-and-particle instruments in a better position for their outbound measurements. For our work in Berlin, the spacecraft attitude commands were compiled through a Cassini-internal software (named PDT) which was operated by Thomas Roatsch at DLR in Berlin-Adlershof. Together, we compiled the ISS mosaics of all Dione, Rhea, Iapetus, and outer-moon observations (including the targeted flyby at Phoebe on 11 Jun 2004, two weeks before Cassini arrival at Saturn and orbit insertion). Fig. left: Example of a global NAC mosaic of Dione during the first targeted flyby (11 Oct 2005; orbit 16; flyby 016DI), designed by Thomas Roatsch and myself. The visualization was possible with the ckView tool developed at DLR Berlin by Thomas and by Klaus-Dieter Matz. The individual frames show the field-of-view of the NAC camera, the numbers the order of the observations. This observation is also visualized in this movie. Note that south is up in the movie, while north is up in the map. 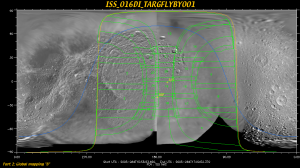 I performed the camera commanding with a special software (named ISSPT) provided by the Cassini Imaging team. It allowed me to select and determine multiple parameters of the ISS, like absolute timing of the shutter activity, selection of the desired camera (NAC, WAC, or both simultaneously), exposure time, image binning (“summation”), gain state (“sensitivity”), data compression type, grayscale range (4096 or 256 different gray or “DN” values), color filters (on two different filter wheels), pixel-bleeding suppression (“anti-blooming”), CCD readout times, time gaps between individual images, etc. The resulting command output file was used to execute the operation of the camera near Saturn. The camera and the spacecraft attitude-control activities were solely linked through the spacecraft clock. Through a trigger command which contained a start time, the camera could be activated. The header image of this webpage shows an example screenshot of the ISS planning tool for an observation of irregular moon Siarnaq in orbit 200. Each row is one image (one shutter activity). FTim (to the right) indicates the total frame time (in seconds) for each individual image. CL1 and CL2 are panchromatic “clear” filters with the broadest throughput of all available filters at wavelengths from near-UV to near IR. SSR indicates the predicted data usage (in megabits).